The Battle of Big Dry Wash is considered to be the last major battle between the Army and the Apaches in Arizona. In late spring of 1882 a group of Apache warriors, restless and dissatisfied with reservation life, united under the leadership of Tonto Apache Na-ti-o-tish. After stealing horses and ammunition from the reservation at San Carlos, they crossed the Salt River heading north into Tonto Basin. The warriors raided and terrorized settlements throughout the Basin and Pleasant Valley. Settlers were murdered. Early morning, July 17th, at the Meadows family’s Diamond Valley Ranch (near what is now Whispering Pines), John Meadows was shot and killed. His son, Henry, died shortly after the raid of his wounds. News of the raiding reached the Army. Troops were dispatched from forts surrounding Tonto Basin. The Apache raiders were now heading northeast. At the top of the rim they spotted a pursuing troop. Na-ti-o-tish proceeded to set an ambush about 7 miles north of General Springs where a fork of East Clear Creek cuts a deep gorge into the Mogollon Rim at a place called Big Dry Wash.The Indians planned to massacre the troop when the soldiers passed directly below them. As the Indians hid and waited, they were unaware additional troops had arrived. Na-tio-tish had failed to post lookouts. The Indians underestimated the number of troops in pursuit. Al Sieber and his Indian Scouts accompanied Capt. Adna Chaffee’s Troop D, 6th Cavalry from Fort McDowell that day. It was Sieber who discovered the ambush and warned the troops. As the Indians lay waiting, Capt. Chaffee positioned troops in flanking positions to the right and left of them. Other troops were directed to follow Crook’s Trail to the top of the Mogollon Rim in order to block the Indians from making an escape into Navajo Country. Accounts differ regarding who shot first. Some claim the Indians opened fire first. Others reported it was the Army. After the battle, under cover of darkness, the Indians stole away. In the aftermath the bodies of 22 Indians, including Na-ti-o-tish, were found. Pvt. Joseph McLernon was the only soldier to be wounded during the battle and die at the site. He is buried there. 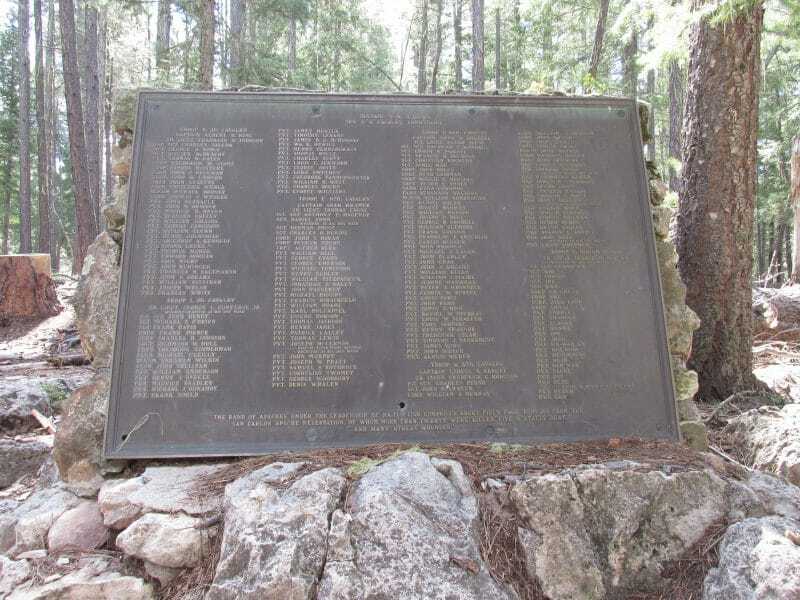 A monument was erected in the 1930’s by the Forest Service and the Civilian Conservation Corps. One side is a summary of the fight. The other side lists all the soldiers and scouts who took part in the battle. North on Highway 87 through Pine and Strawberry. Continue past the Camp Verde turnoff (Highway 260) a few miles to Forest Road 300 on your right. Drive east to the Battle of Big Dry Wash historical marker, along the Rim Road near General Springs, Arizona. Next post: Who Was Betty Zane?